Your 5 days 4 nights Canadian Rockies experience start with airport pick up from Calgary International Airport. 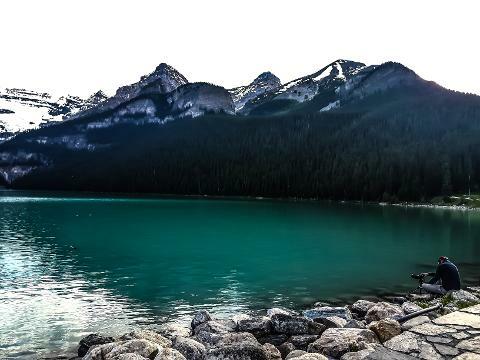 Embark into shuttle bus provided for you sit back and enjoy breath taking views as your driver takes you for an hour drive from airport to the majestic Canadian Rocky Mountains with cascades of mountains that begins from Canmore and ends in Jasper. Calgary airport pick up transfer for hotel check in at Holiday Inn Hotel Canmore or similar hotel. After check in explorer the city of Canmore at your own pace. At 7:00pm the group meet for welcome dinner at Spice Hut Indian Cuisine. Enjoy mouth watering dinner specially made for you and your group in mind. Safety briefing for your tour package follows after dinner. At the end of dinner hotel transfer if you wish you can explorer Canmore night life at your own pace. Just remember to go to bed early as the next day will be long and full of breathtaking views as your driver/guide takes you to Jasper. |7:30am| Depature for Jasper| Get your camera's ready at this point of time your journey will be full of breath taking views. Columbia Ice Fields, first stop of the journey; enjoy breath of fresh air from the peak of the mountains as we hike up close to Columbia Ice Fields the Athabasca Glacier look out point. 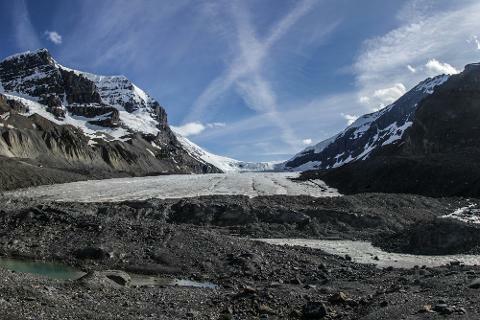 Take some stunning memorable photos of Athabasca Glacier, surrounding mountains and wildlife. At the end of hike return back to tour bus for lunch box lunch. After lunch fasten your sit belts for 15 mins ride to Jasper Glacier Sky Walk. 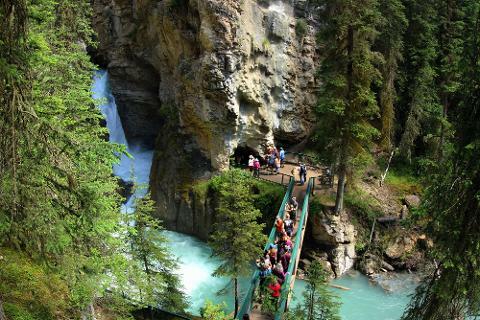 Step out on a cliff-edge walkway where giant glaciers perch above you and the spectacular Sunwapta Valley spreads out below. 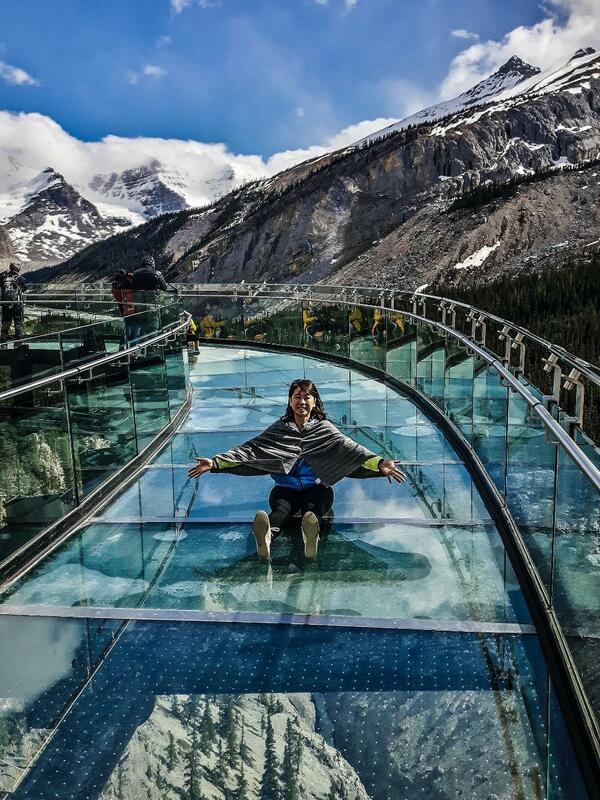 The Glacier Skywalk experience features waterfalls, wildlife, fossils and more on an exciting 1-kilometre walkway that leads to a platform where glass is all that separates you from a 918-foot 280 metres cliff drop. Absorb cool mist from stunning Athabasca Falls and Canyons. Your last stop of long day of Exploring Jasper end at Athabasca Falls. Pouring over a layer of hard quartz, the falls have cut into the softer limestone beneath, carving intricate features, including potholes and a short canyon. 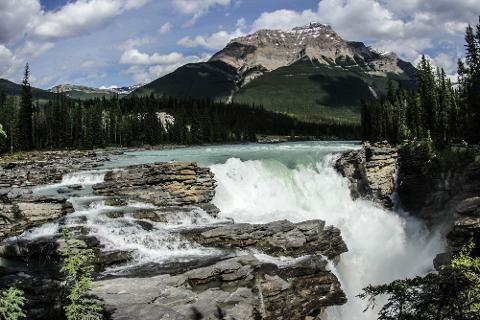 Flowing from the glaciers of the Columbia Icefield, the Athabasca River is the largest river system in Jasper forced through a 3 meter canyon to form powerful waterfalls. At the end of exploring Athabasca Falls your driver will drive you to town of Jasper where you will spend your night. |10:00am| Start your relaxed morning with one hour horse back riding immersed in the deep green and stillness of the woods. 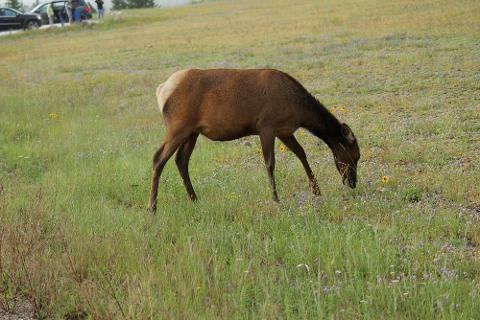 Be on the look-out for wildlife that frequently roam the trail. 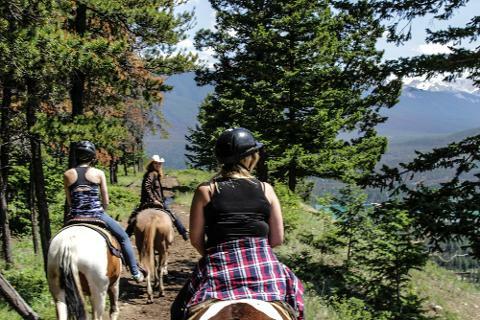 Half way the trail your experienced tour guide will share some Jasper history and point out some of famous mountains that includes Whistler mountain which can been seen from a distance on your trail. After fun horse back-riding your driver/guide will take you for a Skytram ride 2277 meters above ground level. Prepare to be mesmerized by Jasper Whistlers mountain. Hike trail Summit of Whistler mountain for better 360 panoramic view of Jasper national park. At the end of hike sit back for lunch box lunch provided. After lunch your driver/guide will take you to turquoise Peyto Lake. At Peyto Lake your guide will hike with you to the view point for sightseeing and photography. Tour ends with tour-bus ride to famous Lake Louise where you will spend your night. |9:30am| Your morning start with stunning turquoise view of famous Lake Louise. Take a walk to remember on Lake Louise trail as your mind get mesmerized by jaw-dropping sights surrounding Lake Louise. Moraine Lake awaits for you after lake Louise sightseeing. Your driver/guide will guide you to a vivid shade of turquoise that changes in intensity through the summer as the glaciers melt at Moraine Lake which is perfectly set in the rugged Valley of the Ten Peaks, Moraine Lake is surrounded by mountains, waterfalls, and rock piles, creating a scene so stunning it almost seems unreal. Sit lakeside and absorb the sights and pure mountain air, or explore further by hiking. It’s an iconically jaw-dropping place that is sure to leave a lasting impression. Your long day of adventure ends with Johnson Canyon Catwalk hike. Enjoy natural view of Johnson Canyon; over hanging canyon walls, waterfalls, deep blue pools of Johnson creek. Johnson Canyon 30 mins Catwalk trail takes you to stunning lower falls and canyon cave an addition 30 minutes will take you to upper falls. At the end of Johnson Canyon hike your driver/guide will take you to your hotel in Banff where you spend your last night at the Canadian Rockies. Breakfast - Hotel Check outs - All good things comes to an end. It's time to leave beautiful Canadian Rockies. 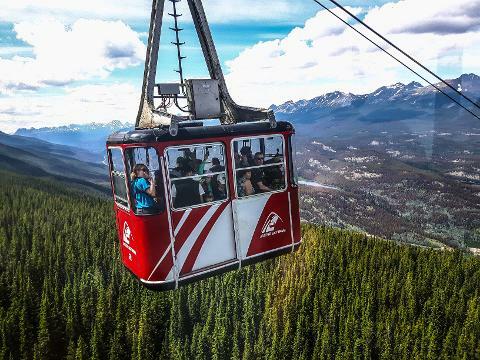 If your flight schedule permit, take some time to buy some souvenirs or try Gondola ride in Banff.